Members recently enjoyed a ‘hands on’ evening when local ‘scrapper’ Shelley French came along to our recent speaker meeting. 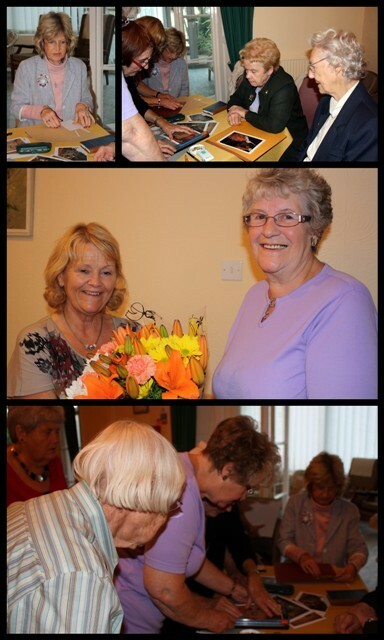 Shelley gave a practical demonstration & talk to members on the increasingly popular hobby – Scrapbooking. Are your photos gathering dust in a cupboard? Or worse still, are they stuck in a standard photo album which is gradually deteriorating your precious memories? You might prefer to see them in a scrapbook album illustrated with co-ordinating embellishments and detailed journaling knowing that they will preserved for years to come. Many of us will remember making scrapbooks as children –saving ticket stubs, brochures from holiday destinations, notes and newspaper clippings, special birthday cards or postcards and pasting them randomly into a sugar-paper album. That was scrapbooking THEN. Scrapbooking NOW retains some of those elements, such as preserving precious memories, but focuses on the important elements of safety and longevity, journaling, and creative expression. But don’t be put off – you don’t have to be creative or artistic to enjoy the hobby – you will be amazed at what you can create to enhance and preserve your own family photos.